Super Heavy-Duty 2" Secure-Locking Ratchet with Extra Wide Handle. Integrated, Adjustable Axle Loop with 12" Protective Nylon Sleeve. Heavy-Duty Secure Twist Hooks. Durable Extra Security Stitching. 8,000 lb. Capacity. 6ft Length. 4 Pieces. 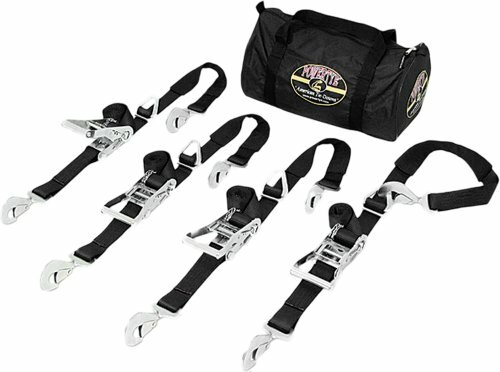 Kit Includes: 4 - 2" 6ft Auto/Axle Strap w/ Secure Twist Hooks & Protective Nylon Sleeve 1 - XL Storage Bag.